Taking tours in Israel brings a lot of excitement, adventures and a better insight into the history and culture of any visited place. For those in search of adventure, as well as water sport fans, they can enjoy plenty of them since Israel has some of the most beautiful beaches in the Middle East. Once in Israel, one cannot miss spending a night in some its most luxurious and beautiful boutique hotels that have lots to offer, from swimming pools, sea views, gyms and spas, to unique areas for parties and restaurants serving delicious, both Israeli and international cuisine. 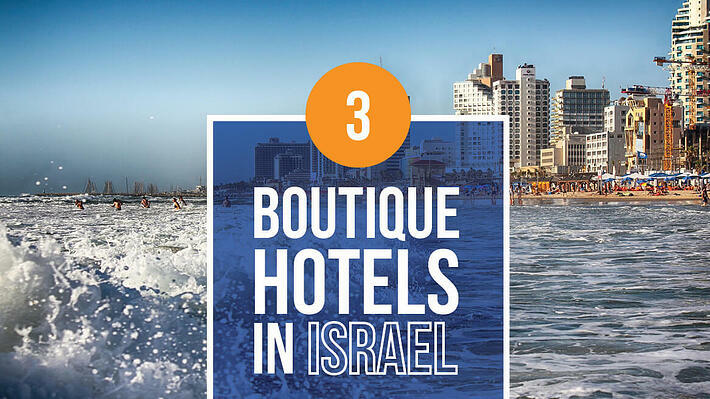 Here are the three boutique hotels you’ll find in Israel, considered to be among the best hotels in the country. The vibrant city of Tel Aviv is home to one of the best and most luxurious boutique hotels in Israel. Its visitors leave with an unforgettable experience. The hotel is a blend of remarkable service and 1920s elegance. The hotel consists of two historic buildings, exquisitely renovated in an exceptional architectural grandeur. The Norman hotel offers exclusive facilities like a rooftop pool, wellness area, a fitness room and superb dining restaurants. The accommodation of this hotel offers its guests heavenly comfort in splendid elegance. The hotel is proud of 50 luxurious accommodation choices. The main hotel building holds 30 guestrooms, while the next-door building features 20 magnificent suites, both for short-term and long-term stays. Both suites and guestrooms are a fusion of old and new- antique charm and the latest technology. Throughout the hotel, guests have Wi-Fi access, business services, complimentary mineral water daily, shoe shine service and many other services. The amenities guests can find in their suites and rooms include: Wi-Fi, 40-inch flat screen Loewe TV, Bluetooth sound system, mini-bar with premium & organic snacks and beverages, personal electronic safe, smart control system and many more. The Norman hotel features its own elegant brasserie style restaurant and Japanese Tapas restaurant. Both restaurants are located in the main building. The hotel also features conservatory rooms, suitable for meetings and events. The conservatory is surrounded by fresh jasmine, rosemary and citrus trees. After an exhaustive time in the city, guest can pamper themselves in the wellness area in the hotel. They can enjoy various treatments and receive high quality service from wellness concierge team. The area is open from 10 am to 7 pm. Rothschild 22 is a unique, luxurious and new boutique hotel located in Tel Aviv, on the Rothschild Boulevard. Designed by one of the Israel’s leading designers, Ari Shaltiel, the hotel is a blend of modern, elegant and pastoral style. As the Rothschild Boulevard is a bustling place, the hotel is surrounded by many cafes, restaurants, galleries, museums and many more. The hotel offers 156 rooms with the latest designs and intimate, serene atmosphere. Each room is adorned with velvety and soft bedding from the fines linen, a 48’’ HDTV, a digital library, a Nespresso machine, a work desk and L’Occitane beauty products. The hotel offers pay-per-access meeting rooms, up to 12 participants, and those with ongoing work can rent an office as well. A luxurious Tracklin Business Lounge is something the hotel is especially proud of. It is located on the 10th floor of the hotel, overlooking the city of Tel Aviv. It is equipped with a fax, computer stations, fast Wi-Fi internet and a buffet that offers wine and soft drinks for refreshment. To make their guests’ stay the most pleasurable and relaxing, the hotel boasts of its air-conditioned gym, equipped with the latest facilities. Bicycle rental service is accessible, and it is free of charge. The breakfast is served in a kosher restaurant Gallery 22. According to TripAdvisor Travelers’ Choice, Rothschild 22 is rated as one of the best hotels in Israel and the Middle East for 2017. If you are looking for a vacation from your dreams, Eilat is the right place for you. Among many hotels you can find there, the Orchid Reef hotel is one of the best four-star hotels, and the only one boutique. What makes this hotel stand out from others is its location- on the beach near the Coral Reef Reserve. From the hotel’s 79 rooms, you can choose from luxurious deluxe rooms, deluxe direct pool access rooms, and deluxe pool rooms to eminent private pool suites for two children and two adults. The hotel offers sun beds, seating areas, a swing, a swimming pool, beach access and modernly equipped gym for the guests. All rooms in Orchid Reef hotel are air conditioned, furnished with a king-size bed, LCD TV with over 100 channels, well-equipped and extravagant bathrooms, a comfortable seating area with a coffee machine and fridge, and a sea view balcony. To provide best possible service and make its guests feel as comfortable as possible, the hotel services include WI-Fi access in every room, children’s club, bicycle loan service and international calls. The guests of the hotel can enjoy sport attractions, like scuba diving, snorkeling, windsurfing, kite surfing, canoeing, water skiing, sailing boats. There is no extra fee for these activities, except the insurance fee. The hotel also offers spa complex and a fitness facility. The hotel’s restaurant serves international and Israeli cuisine. They serve buffet breakfast daily, delicious cakes and a variety of food. For many guests, they were surprised to have a rich and quality food for breakfast.